The sustainable food movement can be construed as kind of pretentious. The intentions are noble: Eat food with local roots, and save both the environment and your health. As with any pushy doctrine, anytime someone tells the world what they believe others should be thinking or doing, the results can feel a bit cloying. But that’s never been the case with Daniel Klein, the adventurous chef and filmmaker behind The Perennial Plate. For a year, he and his counterparts have produced stylish videos that are as edifying as entertaining, proving the old maxim that showing is always better than telling. He’s become the Johnny Appleseed of the local food movement, minus the freakishly long limbs. In February, he began blogging for Huffington Post, which has since led to increased exposure and shout-outs from folks like Michael Pollen and Andrew Zimmern. 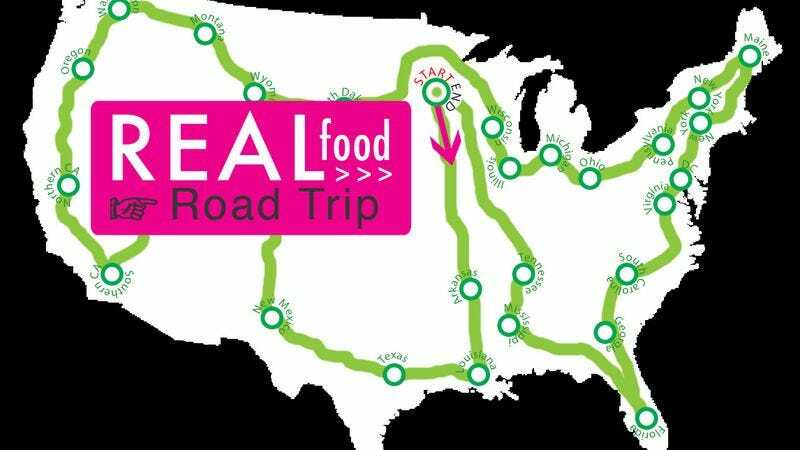 After his year-long Minnesota-centric food doc rapped in March, he announced he was taking The Perennial Plate on the road. Beginning Monday, May 9, Klein and Mirra Fine, his behind-the-scenes collaborator, set off on the cross-country tour that will become their second season. Before they hit the highway in their new eco-conscious vehicle (courtesy of Toyota), we asked Klein a few questions about where their work is headed. The A.V. Club: When you did a local weekly series, you had a new topic every week. Do you know the topics you’ll be covering on the road? Daniel Klein: We don’t know all of them, but we know most of the topics for Iowa, then Arkansas, Tennessee, Mississippi, Louisiana, Texas, Colorado. We know the first couple of months. We’ll be looking at urban gardens, we’ll do some catfish noodling. Know what that is? DK: They also call it hand grabbin’. It’s catching catfish, but you do it by putting your hands in rocks underwater. They nibble on your fingers and then you just grab them. People lose their fingers—not from the catfish, but from snapping turtles. That’ll be the topic in Mississippi. AVC: You do a new video every week. It seems like a pretty quick turnaround. DK: Really quick. We haven’t made a video yet for this tour, but we’ll be releasing the first one on the 16th. It usually takes a couple of days. Anywhere from two hours in filming to a few days in filming, and it usually takes a couple of days to edit. It will be interesting to see how it’s done on the road; I’ll have to edit while driving—well, Mirra will drive and I will edit. AVC: Has Mirra always been involved with Perennial Plate? DK: No. Well, she was involved in the sense that I would discuss ideas with her. Originally, my cousin Tim was helping me out with all of the filming. But then I asked Mirra randomly if she could film something, and she just began doing it more and more frequently. So it was a slow process. She wasn’t on board right away, but towards the end of it, she became a much bigger part and had a larger role in the online stuff as well. AVC: Yeah, it seems like she’s more visible now. I’ve seen her writing on the blog. DK: Yeah, we wanted to make it more than just videos. So bringing in the blog, we thought people might be back more than just once a week. But also, it introduces a new perspective. I think it introduces a different, maybe more moderate point of view that’s also funny. DK: I have been an activist, and that’s why I do things. But I hate the pushy point of view. The underlying hope behind the series is that people will change the way they eat to more sustainable practices, more family oriented, getting in touch with their food. I don’t think pushing things on people is very effective. My method is through entertainment. I’m not going to hide the fact that I want people in America and the world to be more responsible with the way they eat. AVC: Will you still be blogging for Huffington Post during your national tour? DK: Yes, that will continue. We’ve been putting up two of the old videos every week. Now we’ll be putting up a new video, additional footage or original writing that will be a second entry every week. It brings so much traffic to the site. AVC: It seems like things really blew up for Perennial Plate when you started that. DK: Yeah, the blow up really started when we became very active in social media. Not just Twitter and Facebook, but we did a lot of outreach to people who had blogs who we thought might be interested in the show. And that wasn’t until nine months until after we started. People would stumble upon the site and discover the huge backlog of stuff, and they’d feel like they had to share it. So that led to Grist, and Grist led to something else, and that led to Huffington Post, and Huffington Post brought in a lot of opportunities. AVC: You raised money with Kickstarter for your national tour. DK: Yeah, and we used Kickstarter when we started the original show, too. Then we gave ourselves three months to raise $10,000. We made it, but just barely. This time around, we raised $20,000 in about two and half weeks. AVC: And Toyota’s just giving you a Prius. DK: Yeah, well, not to keep, unfortunately! But yeah, they’re giving us a Prius to use for six months. I think I’ll put something on the website if they want something up there, but there’s not really any stipulations. We’ll be in our car driving and filming across the country, so it’s going to be pretty difficult for the car not to get some airtime. And it’s obviously a wonderful thing for us, because it’s environmentally friendly and requires less gas. AVC: How did you get Toyota to let you use a car? DK: We’ve been looking for a long, long time for a car, actually. We got connected to a brand placement agency that specifically works with putting Toyota cars in TV shows. I’m actually looking forward to seeing Pom Wonderful Presents The Greatest Move Ever Sold. Any sponsorship we went for we wanted to be something we liked or believed in. AVC: What are your larger goals beyond this national series? Or are you just focusing on the present? DK: I’m focusing on the present, but I have some next steps. We’re going to be filming this in a way that would make it easy to turn this into a TV series or documentary. So we’re going to be filming a lot of extra footage with the hope of creating something bigger. I’d also love to do a book about the tour, and there’s plenty of other potential future stuff, but that’s all within the next couple of years.